Seat has a mechanical suspension with hydraulic shock absorber. The suspension comprises tension springs with an oil-hydraulic shock absorber. 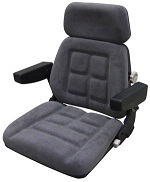 Features: adjustable angle base, fore and aft slide adjustment of 6" in 1/2" increments, suspension stroke of 4", linear weight adjustment from 100-265 lbs, width of 18 1/2"
Seat, backrest and headrest have contoured foam cushions. Cushions are vacuum formed for maximum comfort. Backrest has adjustable lumbar support. 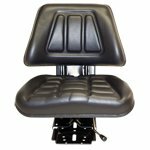 Backrest angle adjustment control for individual comfort settings. Headrest pulls out of backrest. Armrests fold up.